At the 14th annual Oregon Cheese Festival in Central Point, March 16–18, thousands crowded the big tops at Rogue Creamery, eager to taste the latest cheeses from the state’s talented artisans along with Oregon’s finest wines, spirits, honey and much more. This year’s celebration started with a Friday evening cheesemaker’s dinner, each of four cheese-focused courses carefully paired with Oregon wine. Before the first plate was served, a social hour allowed even more opportunities to sip and savor with a trio of beverage options: Ledger David 2017 Sauvignon Blanc; Simple Machine 2013 Vector, a blend of Syrah and Grenache; and a perry (pear cider) from WildCraft Cider Works. With a hundred mouthwatering cheeses displayed to admire and taste, it was difficult to maintain decorum in the middle of such abundance. During the feast that followed, TMK Creamery of Canby featured its smoked garlic cheddar in a creamy fondue served in a roasted apple, accompanied by candied bacon and a house-made duck and fennel sausage. Irvine & Roberts 2016 Rosé elevated the flavors to lofty heights. Another standout combination was Pebblestone Cellars 2012 Syrah paired with New York strip topped with balsamic Port reduction and mushrooms. Next to the tender beef was a savory confit of leek, mushroom and Helvetia Creamery Apfelheller. The jammy, fruit-forward Syrah tasted of cherry with a black pepper finish, complementing the richness of the dish. Chef Maggie Trujillo developed the menu for the special dinner hosted by Larks of Medford. She gracefully accepted a standing ovation from the crowd at the end of the meal. 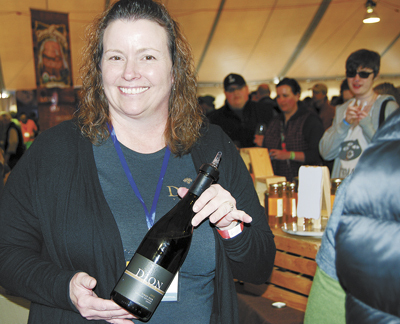 Saturday and Sunday, the main celebration at Rogue Creamery offered products from 23 cheesemakers, 35 food vendors, 12 wineries and more than 20 distilleries, craft breweries and cideries — all Oregon, all craft. 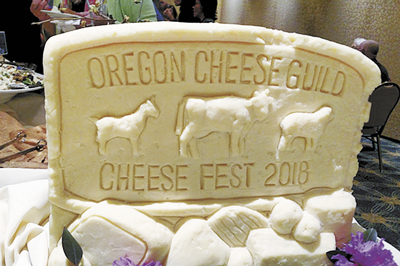 The Oregon Cheese Festival draws food and drink lovers from all over the Pacific Northwest, including Daniel Lueert, of Goettingen, Germany, who is student-teaching in Grants Pass this term. He was ecstatic, saying there was nothing like the Oregon Cheese Festival in his home country. “I know of a few small local businesses, but in Germany it’s more like commercial cheese from big factories, not small vendors with specialty cheese.” Beer is the same, he explained, with few local producers, as they can’t compete with the big brewers who sell all over the world. “It’s different here; people really appreciate the taste of local cheese, local beer,” Daniel said. He tasted throughout the day, taking home cheese from Ferns’ Edge, Tillamook and Briar Rose, among others. TMK cheesemaker Shauna Garza wooed guests with her delicious garlic-dill curds. “We have our own cows, [and] we grow all of our own seed, so we know what they’re eating,” Garza said. The crowd was eager to taste their home-grown products. The Oregon Cheese Festival is the brainchild of Rogue Creamery founder David Gremmels. Fourteen years ago, he conceived the farmers’ market-style gathering as a way to promote awareness of Oregon’s artisan cheese. Mark your calendar now for next year’s Oregon Cheese Festival, March 15–17. 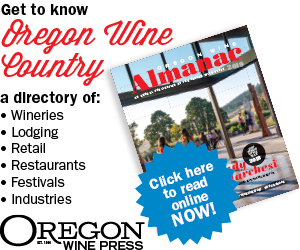 For more information, visit the Oregon Cheese Guild website at oregoncheeseguild.org.